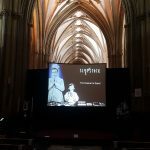 Slapstick Festival 2019 - Evans Audio Visual Staging Ltd.
Once again Evans are proud to be supporting the 15th annual Slapstick Festival in Bristol. 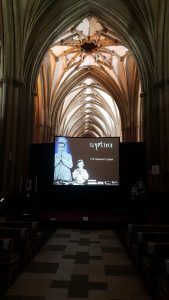 This year’s festival began on Weds 16 January with ‘Slapstick at the Cathedral’, hosted by comedian Robin Ince. The evening also included a screening of Harold Lloyds ‘For Heavens Sake’ (1928). Following this, the classic comedy set up at Bristol Old Vic takes place from the 18th-20th January. Promising to be a fully packed programme with Laurel & Hardy shorts (accompanied by a live piano) to behind the scenes chats with Frank Williams (The Vicar in Dads Army) and the creators of The Inbetweeners, it guarantees something to appeal to everyone. Following the main festival, Slapstick present The Gala at The Bristol Hippodrome on the 10th February. Probably one of the busiest one day shows, the line up includes a 40 piece orchestra accompanying a rare live screening of Chaplin’s masterpiece ‘MODERN TIMES’. New for this year, children’s TV star Andy Day brings his favourite clips to a younger audience for a matinée performance the same day. This entry was posted in News and tagged 2019, Bristol, Festival, Slapstick. Bookmark the permalink.